Big Bot menu prices at your fingertips. Big Boy Restaurants is a large chain of restaurants with 104 establishments in the United States and 281 locations in Japan. They serve the best double cheeseburgers, which has been their trademark product since their days as Bob’s Pantry in 1937. Below are the latest Big Boy menu prices. They serve the Classic Big Boy, which is a hamburger with two fresh beef patties with American cheese, shredded lettuce and Big Boy special sauce on a sesame seed bun. This delicious burger comes with fries per order. The Super Big Boy is an upsized version with double cheese and fries. The Famous Slim Jim is a sandwich with lean ham, Swiss cheese, tomato, lettuce and special sauce grilled and pressed on a sesame roll. This is a scrumptious sandwich and low in calorie that is great with shoestring fries. The signature trademark of this restaurant is a chubby boy in red-and-white checkered overalls holding a Big Boy sandwich. This famous image was a caricature drawn by Warner Bros. animation artist Ben Washam, and was later improved by Manfred Bernhard, the son of the famous graphic artist Lucian Bernhard. 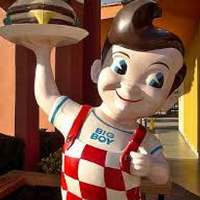 For more information about Big Boy, visit their official website.